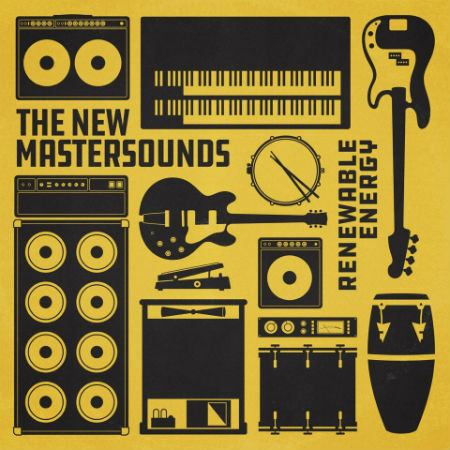 In the course of a career spanning 19 years, 15 albums, and countless tours and live performances around the globe, British four-piece The New Mastersounds have carved out a unique space for themselves as world-class purveyors of contemporary jazz-funk. Their particular blend of mostly instrumental, guitar-driven grooves has developed throughout the years to include a rich tapestry of textures that finds their full expression in latest full-length and 12th studio album, “Renewable Energy”. Recorded in two separate sessions, one in New Orleans and the other in Denver a few months later, “Renewable Energy” expands on the NMS template while still providing plenty of the band’s trademark sounds. Guitarist Eddie Roberts, drummer Simon Allen, bassist Pete Shand and keyboardist Joe Tatton are joined on this 11-track effort by a number of guests: Sam Bell, one of the founding members of NMS precursor The Mastersounds, who also guested on two previous NMS albums, plays percussion on most of the tracks. Mike Olmos and Joe Cohen of West Coast Horns once again provide added horn action as they did on “Made For Pleasure” from 2015, while Adryon de León from LA band Orgone contributes vocals on “Gonna Be Just Me”. Uptempo numbers “Tantalus” and “Yokacoka” see the band flexing their playing chops over a tightly-wound rhythm, while “Green Was Beautiful” and “Groovin On The Groomers” are toe-tapping slabs of soul jazz. The band’s cover of James Gang‘s “Funk 49″ takes the album in a fuzzed-out psych-rock direction with Eddie singing the lead, while the moody Hancock-esque inflections of “Stash” and the sweet mellow vibes of “Swimming With My Fishies” add the final brushstrokes of colour to the canvas.